Strattera has been proven effective at treating some of the symptoms of Attention Deficit Hyperactivity Disorder—or ADHD—but it is not without side effects. Some of the side effects of Strattera include changes in bowel habits, irregularities in menstrual periods and general stomach upset. These side effects are usually mild and do not need to be reported unless they become increasingly bothersome or do not resolve on their own after a few days of treatment. Sexual and menstrual changes may persist for a longer amount of time but these are not life-threatening and are to be expected. Patients are encouraged to discuss any worrisome changes with a physician or other health care provider. Any or all of these Strattera side effects have the potential to be dangerous or even life-threatening. Patients who experience these side effects, or any other side effects that they believe are a result of taking Strattera, should seek immediate medical care. Strattera has been assigned to the pregnancy category C by the Food and Drug Administration. Conducted animal studies have shown that the drug can cause harm to unborn fetuses and potentially even cause death. Pregnant women are advised against using Strattera during any point during their pregnancy. Women who become pregnant while being treated with Strattera should discuss their options with their physicians. There is currently no information available on whether Strattera passes into the breast milk of nursing mothers; lactating women should use caution if they choose to nurse while taking the medication. The FDA has approved Strattera for use in children as young as six years of age. Caregivers of young children should closely monitor these patients for the side effects of Strattera as they are sometimes less evident in young children. The incidence of side effects in children is no greater than that in adults, however. Children who use Strattera should only do so as part of a comprehensive treatment plan that includes regular physical check-ups as well as psychological treatment. This medication may be used alone or with other medications to treat ADHD in children and teenagers. Strattera is a great option for children and adults who suffer from ADHD. 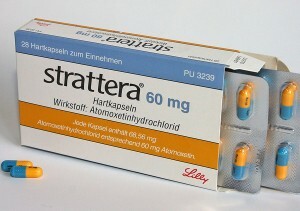 It is non-stimulant and carries with it a lowered risk of serious side effects and abuse, but there are still many side effects of Strattera to be considered.